Quanto mais o jogador explora o game, resolve os desafios e customiza seu mundo, mais recompensas são liberadas. A criatividade irá aflorar enquanto o jogador cria ambientes com ferramentas e pincéis fáceis de usar, incluindo texturas e objetos animados que trazem o cenário à vida. Nas plataformas Playstation 3, Xbox 360, PC e MAC os jogadores podem compartilhar suas criações, soluções e desafios com toda comunidade, seja através de seu console ou do site oficial www.create.ea.com. Seus amigos podem baixar e alterar criações e fazer desafios para outros jogadores que poderão baixá-las livremente. A imaginação que conta! Idioma: Não informado pelo fornecedor. 5,0 de 5 estrelasDon't mistake this game for a platformer! I had to write something. First: This is NOT a platformer. It cannot be compared to Little Big Planet or Super Mario. This is a puzzle game and, as another reviewer noted, a good reminder of "The Incredible Machine". If you're fan of that genre, you'll have fun. If you want to create contraptions just to see what can be done, it's good too, although Little Big Planet is doing a better job at it (that's the only part of this game that can be compared). If you buy this game for a young kid, he can be frustrated very quickly. It can be challenging to go through all the levels. So look at the description of the game before buying it. It's a great game in its genre and there are too few of them. Great game for my 7 and 10 yo kids! My kids report that they love this game. I was a huge fan of TIM (The Incredible Machine) back in the days. 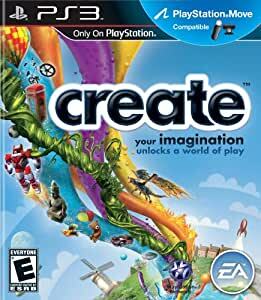 I had always been looking for a game that carried the same ideas, and Create did a pretty darn good job of it! If you love trying really hard to find 'outside the box' solutions to simple tasks, you'll REALLY love this game. I'll start with the cons. I did not use the Move controls, so I can't comment on those. Given the amount of control you have in item placing/tweaking, the menus unfortunately get a bit clunky and confusing to navigate. Fixing an error you made in placing an item (and you will make many) can be quite daunting sometimes. The game has far too much loading time. At its core, the game does fall into trial and error, because just 1 pixel can completely change your entire setup, so you have to be very patient for some of these puzzles. And on to the pros. Again since you have so much control, you really can do anything you want. Don't feel like building a vehicle to transport stuff? Try dropping an explosive on it to send it flying into the goal. Having trouble getting a ball across the level? Put some rockets behind some cars and zoom it away! The utter freedom you have with your solutions is just amazing, and will heavily test your critical thinking skills as well. Honestly, that's all the pro you need. If you like this style of puzzling, you'll be addicted in no time. And that should sum it up. People can freely upload their solutions to the create website, and you can just see how creative people get with their solutions. The one that always stuck in my mind was being tasked to build a vehicle to get a ball on to a platform. The person's solution was to build a series of rotating platforms that bounced the ball around until landing it on the platform. Not even CLOSE to the intended answer! This is a gem of a game, especially since it's at budget price. If you've got some time to spare and want to challenge your brain, try it out! My wife is a wizard with puzzle solving PC games. I thought I'd try to get her to use the idle PS3 for gaming so I bought this game as the reviews stated that it was violence free. The problem is neither of us can figure out how to advance the game. There is no instruction or directions of any kind. It was hard to figure out what one is supposed to be doing on the screen. At one point (very early on) I couldn't create any activity on the screen after pushing every button on the controller repeatedly. If button combos are required, who has the time to experiment with trial and error techniques. Simply found it frustrating after an hour or so of not being able to make anything happen on screen. Granted that all my video game experience lies in racing games, but I would have thought that between the two of us, we could have figured out what the idea is behind this game.